The summit, held before Special Olympics, aims to get organizations out of their silos and work together to make the fitness industry more inclusive of people with intellectual disabilities. 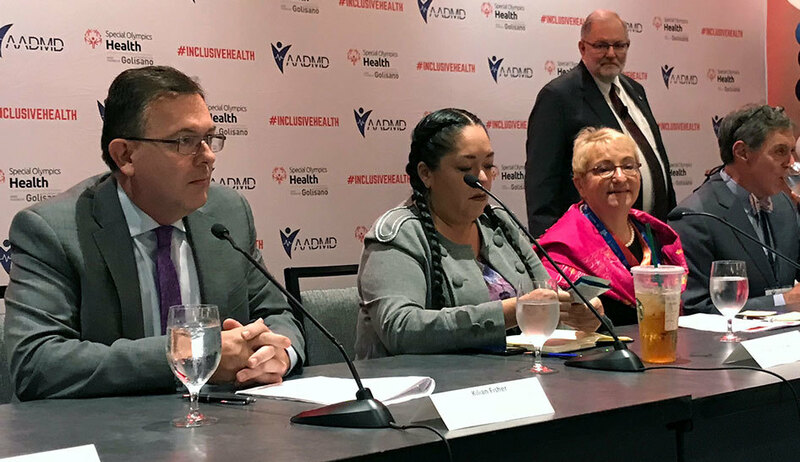 Just two days before the 2018 opening ceremony in Seattle, WA, this July, Special Olympics held the Igniting Change: Inclusive Health Summit in partnership with the American Academy of Developmental Medicine and Dentistry (AADMD). Special Olympics is the world’s largest sports organization for children and adults with intellectual disabilities, providing year-round training and competitions to 5 million athletes and Unified Sports partners in 172 countries. During the event, organizations—including IHRSA—met to identify ways to help more people with intellectual disabilities better their health and well-being through physical activity. Many organizations in attendance also touched on what actions they have taken to be more inclusive, and how these actions have produced beneficial results for community members and business. Kilian Fisher, left, sitting on the "Importance and Impact of Inclusive Practices" panel. Tim Shriver, Ph.D., chairman and CEO of Special Olympics, and the new Chairholder of the UNESCO chair in Inclusive Fitness, Sport & Recreation, PE, also spoke on the benefits of breaking down our individual silos so we are better able to work together to build a healthier world. During his speech, Shriver shared how his mother, Eunice Kennedy Shriver, used her passion to make her dream of starting Special Olympics 50 years ago a reality. Today, he has used his mother’s story and passion as fuel to grow Special Olympics to over 5 million athletes worldwide. The U.S. Surgeon General echoed Shriver’s sentiments during a speech where he spoke about growing up with a brother who has an intellectual disability and understanding the challenges that Special Olympics faces, while recognizing the fantastic work they’ve done and continue to do. He used the phrase “better health through better partnerships” to describe how working together will allow the industry to prioritize this important issue and bring exercise to groups of all ages and abilities.